Interview with one of the guys behind the new Hungarian CT team. The aim of the Pannon Cycling Team is to minimize the huge distance that separates the world's professional edge from the completely amateur Hungarian bicycle market. In the first year, goals were not ranked or number of UCI points, as this would not have much to do with it. For us, it is much more important to develop a consistent professional work, a strong, but not failed, competitive program, a new approach and a good community at our team. If this is achieved steadily, then we can go further and begin the harder work and the pursuit of even more beautiful dreams. Adam Szabo is the DS/head coach. Team: Holló Botond, Ruttkay Zoltán, Zathureczky Márk, Dina Dániel, Dina Márton, Filutás Viktor, Kovács Máté, Kriván András, Orosz Gergő, Simon Péter, Szabó Miklós, Szatmári András, Szöllősi Ferenc és Valter Attila. Indeed it's the Slovakian DS of Nice '17 & Terengganu '16. One of the riders, Miklos Szabó, is a Slovakian citizen as well (possibly a relative), the rest is Hungarians. Adam & Miklos, as can be seen from their names, are part of the Hungarian minority in Hungary. Although they don't have Peak or Pelikan and I only recognise Simon Peter, I do like the fact they have gone virtually all Hungarian and are all fairly young. Contrast with MEMIL who have gone down a different route of, how shall we say, foreign journeymen and only two young Finns. Although they don't have Peak or Pelikan and I only recognise Simon Peter, I do like the fact they have gone virtually all Hungarian and are all fairly young. I recognise Holló and Filutás, though really only by name. Here's an official video on Lars Boom's recovery. 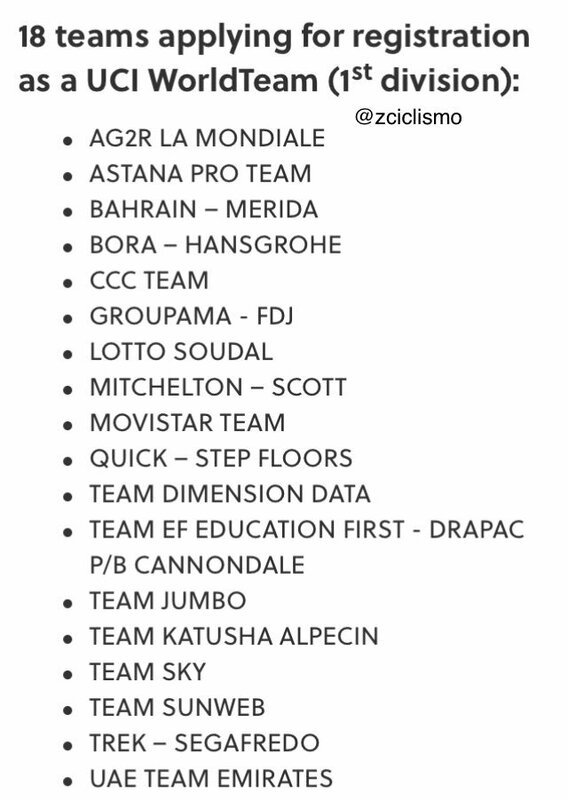 At 33s, next to the EPC chart on the fridge door in what is presumably Boom's garage, the words "Team Sky" are scrawled. Wonder what that's all about? Valjavec hits the comeback trail at the Istrian Spring Trophy on Thursday. The title of this article almost says it all. Basically, Lefevre is thinking he's crashing because he came off the track and isn't used to paying quite the attention needed in a road situation. I find that thought intriguing, especially since Cav came off the track, and has been plagued by crashes as well. It makes sense. Sagan came off mountain bikes, where handling is a priority. Cav and Gaviria came off track success, where handling issues are limited to some argy-bargy between a couple of riders - and track-stands. It only needs to be a miniscule difference in attention. Österreichrundfahrt and Tour of the Alps, he also eyes the Worlds (both road and ITT). Denifl has again problems with his right knee and couldn't train for three or four weeks. He hopes to resolve the problem in the next weeks and return for the Tour of Yorkshire or Tour of Norway. His goals are Tour de Suisse, Tour of Austria and World Championships. Bouhanni has another year to run on his contract but I reckon at this rate he's headed to in 2019 or, if he's really lucky, . Both teams could do with an occasional win and Boubou can deliver it. Ummm. I can't see him moving to - his personality is completely wrong for them. And I have to think Cav wouldn't want any part of Bouhanni on the same team - but that is a mere guess on my part. Of course, Cav may move on himself. But, for sure, I can't see Vasseur having any heartburn over releasing Bouhanni's contract. More like in my opinion. Like M Gee, I just don't see Bouhanni fitting in with at all - and don't strike me as the team that would hire him. 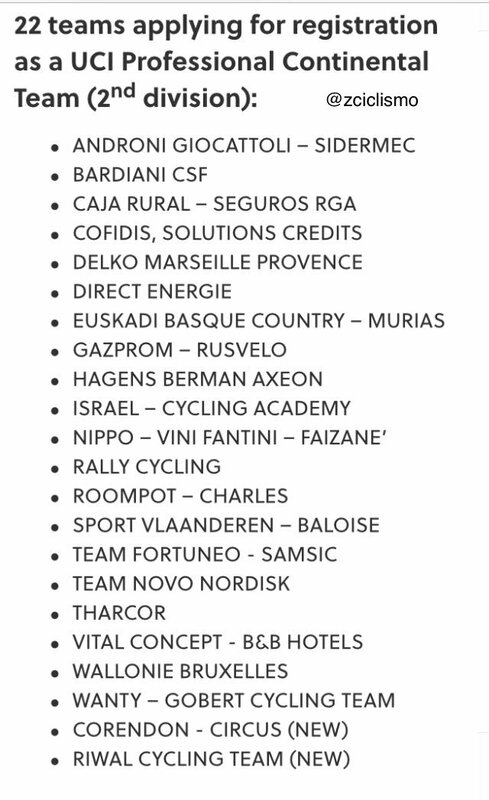 They're all-in behind Barguil for the big races, and then have a bunch of feisty allrounders for the rest. could be a fit ... but they have Coquard already. To sum up, I think Nacer is heading for a big cut in his salary. Yeah, I was just joking about . Not much luck with bringing in big sprinters and all that. would never take him back and is all about Coquard but still needs a winner because Barguil was never going to do much of that. If Bouhanni didn't demand a big train, he might still deliver on the national circuit and perhaps bring in a couple of invites from organisers who like to season their publicity with a bit of on-the-bike scandal. But after that, yeah, there aren't many options left for Boubou if he wants to stay in France. He has already stepped down to PCT and hasn't had too many results to show for it lately, so it's highly unlikely that he would get a WT berth with his reputation. He needs to eat humble pie and let it be known that he can be cheap and flexible. He will need to drop that reticence for which he is famous and talk himself into another deal because I don't think his ego could stand and riding races like Amissa Bongo. . . .He needs to eat humble pie and let it be known that he can be cheap and flexible. It is. Cycling is a hard model from which to make money. But I struggle with how they were able to keep going so long, five years no less, deceiving themselves and their suppliers. I struggle with how anyone can start a cycling event thinking that they will ever make money from it! Not running a monetary loss while giving your sponsors exposure and whatnot, alright - but actually making money? That's for over-charging mass-participation cyclo-tours, 'cross races and track carnivals, not road races. Eritrean rider Awit Andemeskel is riding with an Eritrean licence, but obtained the Swedish nationality in 2017. Armand De Las Cuevas was a bit of a mystery, not least because he refused to talk to journos. Fans were often frustrated: here was a rider whose performances were worthy of great acclaim but about whom very little was known. Inevitably they and the journos made up their own minds and because he had no desire to be a public figure, DLC acquired a reputation for being awkward and withdrawn. In fact, DLC was far from reticent. He was forthright and outspoken and later reflected that this quality, usually so welcome in other walks of life, had probably damaged his career. Moreover cycling was not a deep passion for him and sometimes he would disobey team orders if they seemed wrong to him or if he was crossed. During the 1993 Giro, when piqued by what he felt was dishonesty on the part of his DS, DLC famously pulled off early while riding tempo in the mountains and almost cost Indurain the GC. Banesto did not renew his contract. He retired exhausted and angry over an unpaid salary after ten years in the pro ranks and resolved to take up other interests. He did odd jobs before eventually coming back to racing bikes with an amateur team on the island of Réunion, where he had moved with his wife. As has been remarked in the last couple of days, he would have won the 2006 Tour of Mauritius were it not for a precocious unknown called Froome. Given his eternal reluctance to talk to the media and the privacy rightly afforded to such cases, the circumstances of his suicide at 50 years old remain a mystery, much like the man himself. Burgos and the Manzanistas both missing. Incorrect paperwork or no money/sponsor troubles? Most likely it's missing or incorrect paperwork. I'm a bit surprised that no one has brought this up - I heard about Tafi's desire some time ago. Andrea Tafi intends to compete in Paris-Roubaix at 52 years of age. I wonder if he's not noticed that EPO is prohibited these days. Regardless, if he can make this happen, and if he can just finish respectably, that would be a real accomplishment. He finished within the peloton at a 1.2 race in Hungary this year. That was 'only' three hours and 16 minutes of racing (and apparently completely flat, as well as very fast), but Roubaix ultimately is flat, too. I don't think he will have problems just sitting in the peloton until the pavé sections start. And you don't unlearn how to ride cobbles - the question will be whether he will have the strength to go into the sections close to the front, at least enough to not be held up by crashes and punctures happening to others. Of course, he may always crash or puncture himself. To make the time limit of the 2018 edition, he would have had to hold a speed of ~40-41 km/h over 6:20 hours. I don't think that that's impossible. I think Burgos is in deep trouble. The team has basically gone to ground. It is facing an almost certain UCI suspension and it is very difficult to find any mitigation since this is a particularly egregious case which points a total failure of governance from the team's management. This team cannot survive with its current structure. I have no idea WHERE in the peloton Tafi sat in that 1.2 race, but he could have been coasting in the rear of the peloton. The aero advantage that far back? Remember those beautiful color diagrams about the advantages of drafting a while back? If I recall correctly, the sweet spot did 5-10% of the work of the lead rider. I don't think in Paris-Roubaix that you can stay in any sweet spot. When they hit the cobbles, there won't BE any sweet spot. So, yeah, he'll have to still have some strength. Given the theoretical estimation of power loss as we age, at 52, he could be estimated to be at about 80% of his peak strength. Of course, individuals vary. So, if he actually has a team, as he says, and actually rides P-R, I'd expect him to get dropped early. If he DOES manage to finish, even somewhere in the lower half of finish placings, I expect all the announcers will have a field day hooting about it. I can just hear Kirby already. They have made some decent signings for 2019 (Madrazo, Bico, Penalver etc), but then I thought the 2018 transfers were decent too and they almost universally turned out to be rubbish.